If you were alive in the late '80s, you probably remember a beer-loving, beach-going dog named Spuds MacKenzie who wore sunglasses and a Hawaiian shirt, was always thronged by scantily clad women, and starred in a million Bud Light commercials. The '80s were a weird time, man. 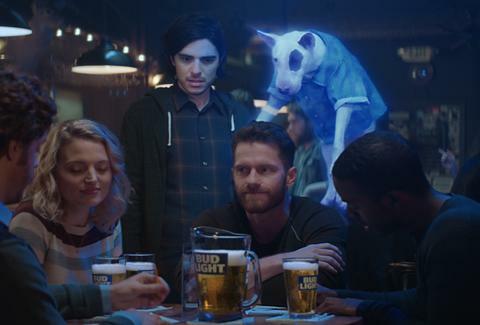 And because nostalgia is all the rage these days, Spuds is back in a new Bud Light Super Bowl commercial about friendship. But this time he's… dead? Take a look below. Bringing America's favorite bull terrier back for the Super Bowl isn't a coincidence. Turns out it's the 30th anniversary of his first ad that debuted during the big game in '87. And compared to the older commercials, this A Christmas Carol-themed oddity has a decidedly modern sense of humor. We're saying the new one's funny and the old ones are strange. Regardless, it's good to see our old pal Spuds back in the limelight. May he live forever. Or, you know, just not be an apparition the next time he's in a commercial. Lee Breslouer is a senior writer for Thrillist, and wants to hang out with a bull terrier. Follow him to friendship @LeeBreslouer.